The Treebeard Problem and Other Things On Theo Epstein’s To Do List. Mike Lowell with Jacoby Ellsbury and Dustin Pedroia. We all know how it works. As soon as you get comfortable, you realize that there is a whole crapload of stuff that you still need to do. It’s the same even for Theo Epstein, whose arrival at spring training isn’t the end of his winter’s work, but just a change in location. Other than deciding on the two or three spots on the bench and in the bullpen that haven’t been settled yet, Theo has plenty to do. Fortunately for him, I’m here with some solutions. 1. The Treebeard Problem. 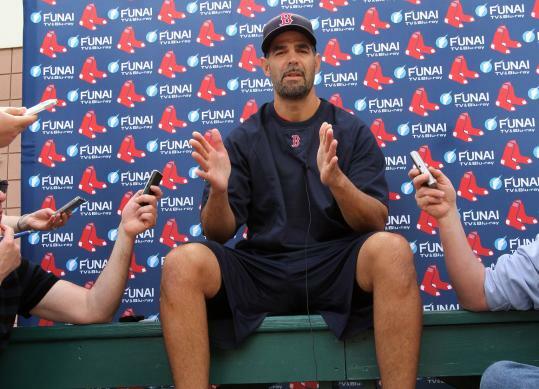 Seems like no matter how hard he tries, Theo just cant get rid of that damned Mike Lowell. After 2007, when he was a free agent, Theo tried to lowball him in the hopes that he would go to the Phillies and break down physically there. Didn’t work, and Lowell took a shorter deal to stay in Boston ( I really can’t blame him). After 2008, hey attempted to sign Mrs. Leigh Teixeira (does it surprise anyone that the Yankees keep finding douches to sign? 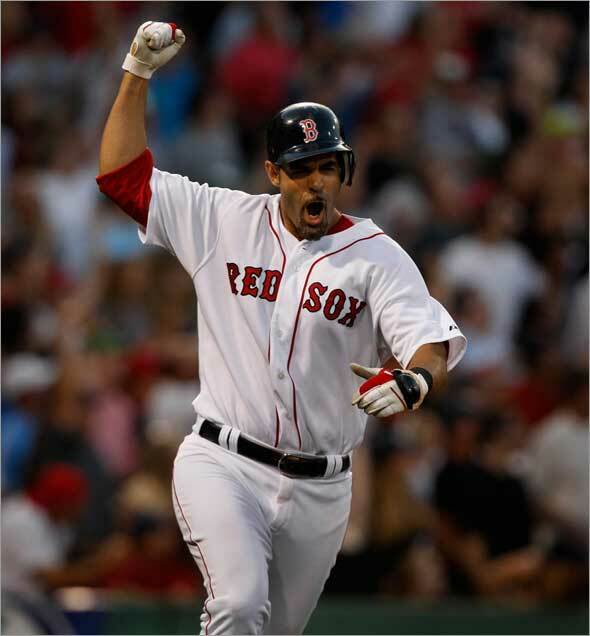 ), which would have sent Youk to third and made Lowell the odd man out. We all know what happened there. This winter Theo tried to send Lowell to the Rangers (along with $9 million) for Max Ramirez, but his injured thumb got in the way of that one. He was severely limited defensively last season, but hit 17 home runs and had .811 OPS in 119 games. He is still a viable offensive force, and if his hip and thumb can get healthy he will still be able to catch the ball with the best of them (not Beltre, but all the others). The real problem is that he simply doesn’t have a spot on this team unless the Sox want to carry two DHs (or something terrible happens). Not a bad idea, considering Ortiz’ struggles in the first two months of 2009, but not something I can see them doing. The most likely move is another trade, possibly the same one as before, but not until Lowell can prove he’s healthy, and according to reports, not likely before the regular season. If the move for Max Ramirez is still on the table at that point, and no better deal is out there, Theo should definitely go back to that well. Wow, He Got Huge This Winter. 2. The Captain and his replacement. Jason Varitek is no longer the starting catcher for the Boston Red Sox. His body has broken down to the point where he can no longer lead the team the way that he did on the field for so many years. Fortunately, the Sox already have a more than viable replacement on their roster in the form of Victor Martinez. Once the Lowell situation is a bit more under control (and even before that) locking up Martinez needs to be a top priority. He has already stated that he wants to stay here for the rest of his career, and will be the best catcher on the free agent market next season if it gets that far (Mauer is a pipe dream, he’s staying in Minnesota). The Yankees would love to be able to replace a 37 year old Jorge Posada with Victor, and you can bet that they’ll pony up the cash if it gets to that point. The best solution is to not let that happen, lock him up for five or six years while guys like Mark Wagner, Tim Federowicz and Luis Exposito develop into what we need them to be (preferably under the tutelage of Varitek after he retires next winter with his third ring). Just make the effing deal. No Matter How Hard You Push, The Wall Won't Get Any Farther From The Plate. The job of a Major League GM is never done, and there are a million smaller issues to handle that you and I have no clue even exist, but these are three biggies. Trust in Theo, and know that he’s on the right track, even if this is a f#$%ing “bridge” year. Today is the first full squad workout and the skies are blue in Ft. Myers. Enjoy. treebeard or the jacked black guy?